Searching for the perfect long-term rental in Spanish Fort? Look no further, because we’ve found it for you! 12953B Churchill Drive is located in an incredibly desirable location in Spanish Fort. This three-bedroom, two-bathroom condo is perfect for small families or young professionals launching their career. 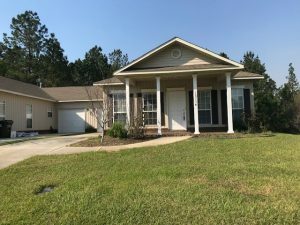 You won’t want to miss out on the opportunity to make this rental yours! From the second you step in, you’re greeted by an open floor plan and plush carpeting throughout the living room. 1,352 square feet of space provides you ample room to furnish to your liking! One of our favorite features of the home is the large, stylish kitchen. Outfitted with stainless steel appliances and sleek black appliances, you’ll also find plenty of counter space to prepare meals and entertain. Another great feature of this home is the picturesque, covered front porch where you can set up lawn chairs to relax and take in the view. Do you have a green thumb? That’s perfect, as tenants are asked to keep the flower beds neat and weed-free. Fortunately, lawn care is included in your monthly! In addition to all of 12953B Churchill Drive’s wonderful qualities, it’s also minutes away from I-10 and fun area attractions. For families renting this home, you’re just minutes away from local schools. Hop on the interstate over Mobile Bay to head into Mobile, where local events and a lively downtown scene await! The area is also teeming with shopping opportunities, including Eastern Shore Shopping Center in Spanish Fort and Tanger Outlets in Foley. Don’t wait! This Spanish Fort, Alabama long-term rental won’t last long. Visit here to schedule a showing!